1. We have experience working on projects in ten different states, and the regulatory environment differs in each of them. In 2018, we learned a lot more about Tennessee, from certification requirements to working with the federal government. We received our Qualified Hydrologic Professional Certificate (QHP), Level 1 Erosion Prevention and Sediment Control Level 1 Certification (EPSC), and TDOT Local Programs Certificates. We also attended the Stormwater Symposium, the TDOT DBE Small Business Annual Meeting, and the Minding the Gap Symposium, as well as dozens of meeting seminars and webinars. The manuals that back our field data forms. Grassland class with the SGI at the Chickamauga Battlefield with Dr. Dwayne Estes. 2. This year, we hosted the first annual Environmental Permitting Symposium, which provided a place for Environmental Consultants, Engineers, Architects, and related other industry professionals to discuss updates to permitting regulations. We are also grateful for the opportunity to speak on a panel with Florence Williams, as well as the chance to be featured in CityScope Magazine. Through these outreach events, we learned how to explain what we do to a variety of different audiences. Eight environmental permitting agencies spoke at the first annual Environmental Permitting Symposium. We had a lot of note takers. The CIVIQ event, moderated by Mark McKnight with the Chattanooga Design Studio. “Movers and Shakers” article in the summer edition of CityScope. 3. We hired a highly intelligent intern, Trent Deason, a Master’s student at UTC under Dr. Hill Craddock. Trent brought new perspectives and motivation to internal projects we have struggled to complete. He also put significant hours behind our research proposals, grassland restoration plans, and other incentive programs core to the mission of our business. Checking out the bioretention ponds at the 2018 Stormwater Conference. Trent researched cost estimates of grassland restoration techniques as compared to traditional lawn maintenance during the Christmas season. 4. We have conducted fieldwork throughout the United States. When compared to an office environment, there is a lot going on in the field that can take attention away from work. Prior to every field visit, we learned as much as we could about the environments we surveyed and created a system for data collection to ensure our projects were complete and accurate. American ginseng. Send any rare plant locality information to the Natural Heritage Program. Looking at macroinvertebrates with Sara Neumann. Long field days with Kalen Foster. Our safety vests and snake gators were not in good shape by the end of the day! 5. We got active in our community. This year, we served as the VP of Programs for the North Chattanooga Council of the Chamber of Commerce, and accepted two additional VP board positions with TenneSEA and the Clean Earth Collective. 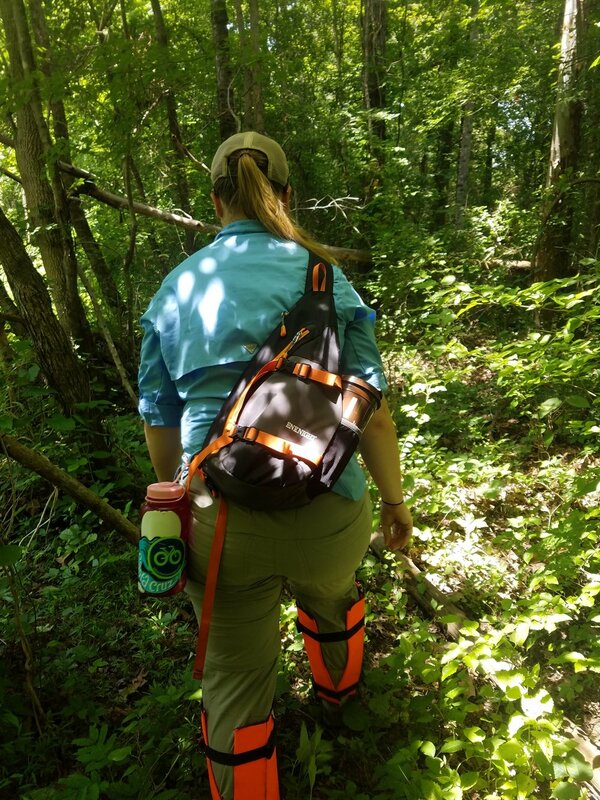 We were also active members of the Southeastern Grasslands Initiative, as well as volunteers with the Tennessee Aquarium Conservation Institute. We taught classes as a visiting professional at UTC, Howard High School, and Notre Dame High School. In January 2019, we will be taking a Master Gardner Certification class, after which we intend to spend at least 40 hours per year on community gardening. TenneSEA, led by Mary Beth Sutton and this year’s Young Professionals Board member, Crystal Bishop, created an amazing rain garden for the Gear Closet this year. Stop by and check it out! Event celebrating the history and recent transformation of Reflection Riding under new leadership. 6. We used Vince Vaughn’s stock photo suite during sales presentations (they are quite professional). We learned that no one notices Vince in the background if the presentation is going well. 7. As a single-owner company, some projects are larger than we are. We learned to rely on our network of agency partners, highly skilled partners, and tremendous library of research when we encountered a difficult project. For example, we visit the UTC Herbarium when we encounter less common plant species in the field, to ensure our identifications are correct. The difference between two species is often as subtle as a few millimeters. Common and rarer species can be difficult to tell apart without this level of identification. 8. Building a work-life balance takes time and patience, especially in a start-up. When planning a conference, scheduling a Hatchie River paddling trip for a project, and maintaining several contracts, don’t let the founder get married in the same month without a wedding planner! The bride and groom, releasing sighs of relief. Each year, we create a Strategic Plan to review our key performance indicators and update our marketing and operations plans. We also review and update short- and long-term goals that will help our business thrive. We would like to share our three main goals for 2019 from this much larger plan. Despite the 0.8 percent decrease in the Environmental Consulting industry, we are prepared for growth in 2019. While we plan to engage additional Clients in the planning and design phases of the commercial development process in the southeast, we also plan to spend time in the state and federal contracting sector. We will be searching for federal set asides for women-owned small businesses (WOSB), for disadvantaged business entities (DBE) with TDOT Local Programs, and for women business entities (WBE) with the City of Chattanooga. Photo Credit: Craig Frasier from the SGI. Grasslands come in all shapes and sizes. This photo from the Arkansas Valley illustrates the incredible diversity of grassland habitats. Photo Credit: SGI. This grassland is representative of the Nashville Basin. It is dominated by the Tennessee coneflower (Echinacea tennesseensis). We compared the costs associated with the implementation of a grassland versus the maintenance of a lawn after one and ten years. On a typical site (without a presence of historical acid mining, for example), our research suggested that grassland restoration will save thousands of dollars on maintenance costs as compared to typical lawn maintenance, primarily after the ten year mark. Furthermore, grasslands are species rich biodiversity hotspots, home to more rare and endemic species than almost any other habitat type. They reduce topsoil erosion, runoff, and provide critical habitat for thousands of pollinators (Southeastern Grasslands Initiative, SGI). We are excited about the prospect of seeing more grassland restoration project in Chattanooga. Next year, we want to help drive inclusion and diversity within Chattanooga, both in our business and throughout the initiatives we support. We are excited to volunteer our time with the organizations we love, and are also interested in learning about the initiatives that help bring all members of our community together. We want to give our Clients and supporters a huge thank you for their time and attention throughout the year. If you love us (we love you too! ), like us on Facebook, or leave a Google review of our company. It helps us establish credibility to continue growing in business. Thank you again, and stay tuned!